This time around, I’ve decided to work on a website exclusive; this is mostly just an exclusive due to the fact I don’t believe the other outlets would care about it as much. Recently, I got around to finally beating Fable II, a game I’ve wanted to play ever since I was a kid. While I had played both Fable I and Fable III in the past, it was because those two games were ported on the PC where Fable II never was. This was fairly upsetting, because Fable II was considered the definitive Fable game. 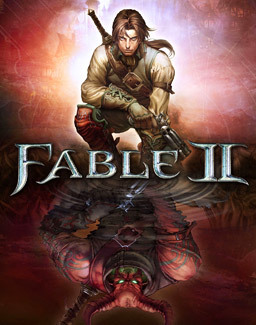 My experiences with Fable I and III were mixed (especially with III, which I hold a particularly love-hate relationship with and will come back into play a bit later in this review) but I decided that this was because they were simply inferior in comparison to II. Finally, when I got an Xbox One just last year, I decided that now was my chance to finally try out the game. And here we are, one year later, I’ve finally seen it through. So, let’s get into it. I also want to mention that for this review I’m bringing back a bit of a classic. Some might remember my old out of 40 review scale from my old reviews on Blogspot; well I’m bringing it back again, this time with a couple of new tweaks. This was one bit I was really hoping they’d improve from the other games, but unfortunately, they did not. This game’s combat is totally broken; there’s nothing more to it other than dodging out of the way and spamming the attack button in hopes of doing something. There are three ways to attack: sword fighting, ranged, and magic. Sword and ranged are essentially the same thing, except one is from farther away. Magic is just straight god awful. In order to use it, you have to press an unholy combination of buttons just to target the attack. Killing enemies using magic is really just not even worth it. Alternate gameplay features of things like the economy meta are decently fun enough but get insanely broken by the end game (just like in the previous two games, you get to a point where you essentially have infinite money). While I do appreciate the Victorian aesthetic, most of the game feels pretty bland in the art department. The concept art done in caricature form is pretty interesting, but you rarely see it throughout the game. Another thing I noticed; not sure if this is just due to the Xbox One uprez, but the entire game looks significantly blurry. Alright, I do have a bit of a soft spot for the music in this game. In reality, there’s probably only like 5 tracks in the whole thing overall, but most of it does sound good and does very well fit the theme of the game. They… tried? It always feels like they give at least some attempt for the stories in this game. The opening seems fairly nice – the classic hero’s journey – but as time goes on you just sort of forget the story as a whole. You also don’t make connections with any of the characters; typically I wouldn’t care too much about this point, but in this game it seems like they want you to have deep connections (some of the ending decisions require such a thing to make sense). Overall, I’d say Fable II is much like the other games; a pretty lackluster disappointment. While there are bits and pieces of the game to enjoy, overall the game still leaves much to be yearned. This disappointment strikes hot in II specifically, as it is supposed to be the best but rather falls flat in the same ways as the others. The four main pillars of a game, in my personal opinion, are gameplay, art, music, and story. Gameplay is essential, and is how a game feels. Art is how the style of the game best represents its theme, and is a mixture of both the actual style (e.g. Monument Valley) as well as the actual quality of the art (e.g. Red Dead Redemption 2). Music is self-explanatory. Story is a bit more of a loose category; technically most games do not have a story, and for those games I would judge the story category more along the lines of how well immersed you become in the game or otherwise how good the flow is of the external narrative. Interested in seeing more reviews like this? Comment down below with your opinions. Also, don’t forget to follow me on Twitter for more updates on all my projects.